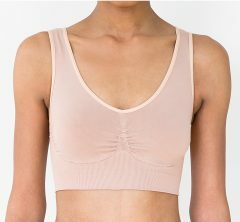 Shaping x-back bralette is an unbelievably comfortable shaping bralette that supports up to C cup. Lightweight silky fabric feels invisible on, slimming and smoothing in sheer comfort. This unbelievably comfortable shaping bralette supports up to a C cup. It is made with a lightweight silky fabric that feels invisible on. The Shaping X Back Bralette Top is slimming and smoothing while keeping you in sheer comfort. This piece is very versatile. It has two-way adjustable straps that allow customers to wear this bralette either as a cross-back or a straight-back. Because of its ease, you can wear the Shaping X Back Bralette alone or under any top! Additionally, the bralette is seamlessly created with key shaping. Customers can pair this shaping bralette with a set of our shapwear top and bottoms for the full look. This stylish addition will add to the smooth, seamless and enhanced figure a CASS look provides. This bra top is of luxury quality. It is a durable and long lasting garment. Lastly, this shaping bralette has MODERATE control. CASS is a luxury shapewear brand known worldwide for its innovative collection of shaping tops, bottoms and dresses. Here at CASS, we merge fashion and technology to provide exquisite fabric and versatile styling. CASS styles are made with smart performance fabric and patented INVISUPPORT®. Furthermore, the nylon performance fabric moves with your body, doesn’t pill and will retain color and stretch. CASS, it’s you, only better!